located in the Chūgoku region on Honshū island. The capital is Matsue. It is the second least populous prefecture in Japan, after its eastern neighbor Tottori. The prefecture has an area elongated from east to west facing the Chūgoku Mountain Range on the south side and to the Sea of Japan on the north side. It is divided into the Izumo Region in the East, the Iwami Region in the West and the Oki Region, a small group of islands off the northern coast. Most of the cities are near the shoreline of the Sea of Japan. Izumo Taisha in Izumo City is one of the oldest Shinto shrines in Japan. The Oki Islands in the Sea of Japan are also part of Shimane Prefecture, which also claims to have jurisdiction over the South Korea-controlled island of Liancourt Rocks (Takeshima).
. Shimane - Entries of this BLOG . Since ancient times, Kumano Taisha Shrine has been known as Izumo-no-kuni Ichi-no-miya, which translates as the highest-ranking shrine in the Izumo region. It is located in a mountainous area approximately 15km south of central Matsue, from where it can be reached in 30 minutes by car. The vermillion Yakumo-bashi Bridge stretches over the clear waters of Iu River in front of the shrine, and there is a water basin where you can purify your body and mind before ascending the stone steps. The main hall in front of you in the middle of the grounds enshrines 'Kaburogi-kumano-no-okami-kushimikenu-no-mikoto', which is the honorific name for the God Susano-o-no-mikoto. On the right side is Inada Shrine which is dedicated to Princess Inada-hime, whom Susano-o-no-mikoto saved from the 8-headed dragon Yamato-no-orochi and married according to Japanese mythology. On the left is Izanami Shrine dedicated to the Goddess Izanami, who was the mother of Susano and Goddess of creation. Kou Shrine and Inari Shrine also stand in the grounds along with other structures, such as Zuijin-mon Gate, Sanka-den Hall, the spiritual dance hall Mai-den and a resting place 'Kansui-tei'. 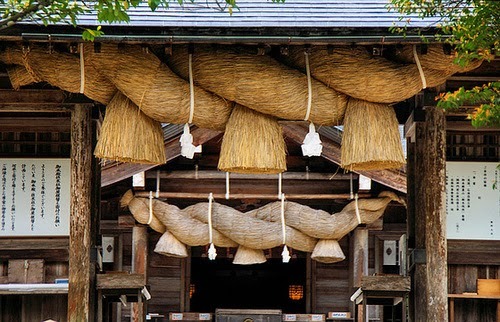 The Sanka-den Hall is a unique structure with a thatched roof. All four walls are covered in cypress bark and it is surrounded on all sides by a veranda made from bamboo. Inside are two old-fashioned fire-kindling tools called hikiriusu and hikirikine. It is an important building used in the annual Sanka-sai Fire Festival and the inauguration ceremony of the Chief Priest of Izumo Taisha. 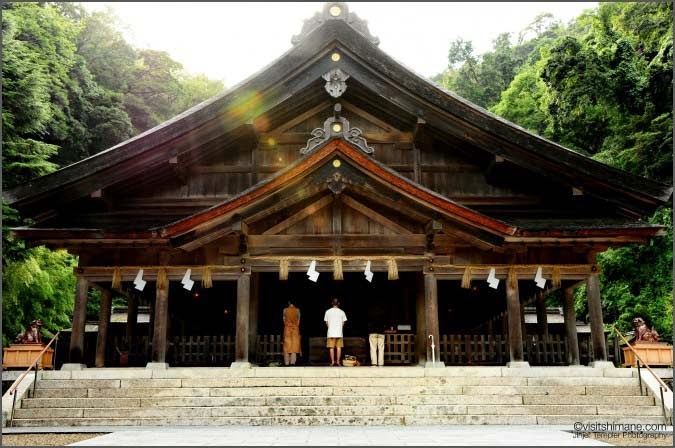 Up to the modern day, the God of Kumano Taisha Shrine has been bringing the creative and harmonizing forces of prosperity and happiness into peoples' lives. Kumano Taisha Shrine dates back to ancient times and was first recorded in the Nihon Shoki (720 AD) in the Empress Saimei chronicle (659 AD). In the ancient chronicles Izumo no kuni fudoki (733 AD) it is written that the shrine was located on Mt. Kumano (present day Mt. Tengu). The shrine appears as Kumano Nimasu Shrine in the Engishiki Jinmyo-cho Notebook (927 AD) and was also called Hinomoto-hidezome Shrine. Since ancient times, along with Izumo Taisha Shrine it has been revered as a grand shrine of the Land of Izumo. It was also deeply revered by the ancient imperial court, and rose from 3rd rank in 851 AD to 2nd rank in 867 AD. In the middle ages the shrine was transferred from Mt. Kumano to the foot of the mountain. The shrine was divided into the upper shrine and lower shrine, and until the end of the Edo period the upper shrine was known as Kumano Sansha Gongen and the lower shrine was called Isemiya. It was worshipped at by ordinary people as a shrine for industrial promotion, good fortune and warding off evil. It was designated as a middle ranked shrine in 1871, and then as a top rank Grand National Shrine in 1916. However, its title was reduced from Taisha, meaning grand shrine, to Jinja (a normal shrine) in the shrine system reform of the Meiji Period. It was finally reinstated as a Taisha in 1978. In the sengu shrine rebuilding ceremony of the same year the buildings within the shrine grounds were reformed, and the Sukei-kai, an organization of local parishoners and believers across the country, was formed. Kumano Taisha Shrine has a deep connection with Izumo Taisha Shrine and Izumo Taisha's festival begins with receiving the holy fire (the spirit of Kumano Taisha's God) and the fire-kindling tools of Kumano Taisha. These implements are also used in the inauguration ceremony at Izumo Taisha and are presented every year at Kumano Taisha's Sankasai Fire Festival. saki mitama kushi mitama mamori tamai sakihai tamae. Kumano Taisha was the most important shrine in Izumo for centuries before Izumo Taisha supplanted it in the late Heian Period. Empress Saimei ordered the shrine built in the mid 7th Century. Before that the shrine was the mountain behind it. Look at more photos by Jake Ojisan ! Winter foods such as Matsuba Crabs which represent seafood of the Japan Sea, the seven delicacies of Lake Shinji, which are abound in Lake Shinji, and Shimane beef, which is highly valued nationwide, are all considered culinary treasures in Matsue. With the leading characters of Yoshiharu Horio, the man who laid the foundations of the city, his son Tadaushi and his grandson Tadaharu, 300 citizens of Matsue will bring to life an array of characters from the early 16th century. All participants will don period costumes and march through the city; the princesses, ladies and ladies-in-waiting looking beautiful, the armoured warriors looking heroic, and the court nobles carrying an air of refinement. the summer festival which best represents the "water city", Matsue. 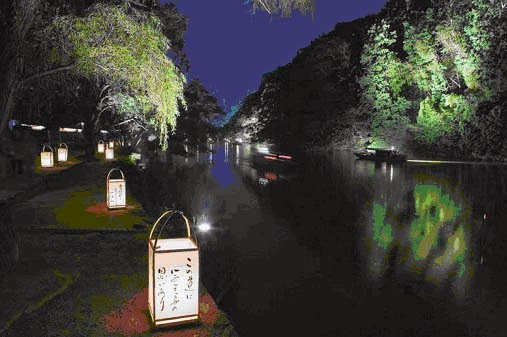 Matsue Suitouro is a festival of water and light, that offers you the opportunity to enjoy the magical view of lantern-lit waterways around Matsue Castle and adjacent to Shiomi Nawate Avenue. he "do"drums,each have a diameter of two meters,are placed on large floats and are pulled by children. The drums are accompanied by flutes,and the sound of this energetic procession echoes through the city. The present-day head priest of the Yokoyama family 横山宮司 is now in the 89th generation. This was a harvest thanksgiving ritual, performed on November 23. After the race, the participants have a feast including a dish with wakame kelp and other types of seaweed. 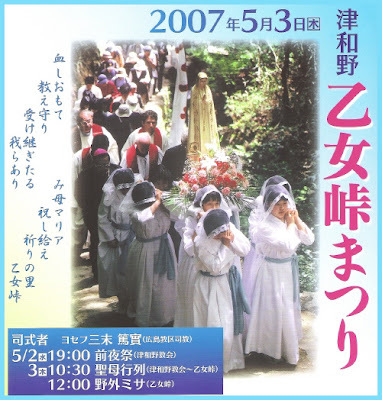 This rite takes place on December 3 at Miho Shrine in Mihonoseki Town, Yatsuka County, Shimane Prefecture. This relates to the myth regarding the transfer of the land (kuniyuzuri 国譲り) recorded in the Kojiki and Nihonshoki. 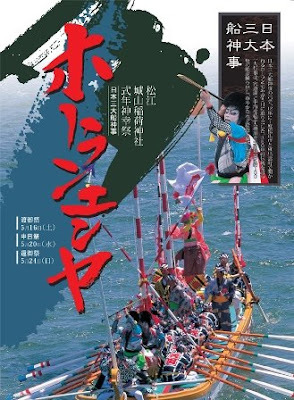 This rite is a recreation of the myth that Ōnamuchi-no-mikoto's messenger who came in a dug-out canoe called a morotabune and the enshrined deity (saijin), Kotoshirononushi-no-mikoto 事代主神, had a talk at the Mihonoseki harbor mouth regarding land transfers. In the evening festival, there is a ceremony with 75 kinds of special food and wine offerings (shinsen) being offered to the kami. On the main festival day, the chief priest (gūji) uses sacred lots (mikuji) to select a steersman and rowers. A parade led by the carrier of a makka (wooden sword), leaves the shrine and goes to Miyanada, which is before the shrine. The gūji oversees the event from a temporary hut built with curtains, in front of Miyanada 宮灘. Two morotabune boats in the shape of ancient dug-out canoes (kurifune). Eighteen people including the makka carrier, steersman, and rowers split up and board the boats, take up paddles and begin rowing out to sea. They row to the east mouth of Mihonoseki harbor, to below the headland Mt. Marōdo, worship at the Marōdo Shrine which 客人社 is dedicated to Ōnamuchi-no-mikoto 大国主神, and then return to Miyanada. The boats do this trip three times, competing against each other. When this is finished, the makka carriers removes the makka from the prow where it had been mounted race to offer it at the shrine. 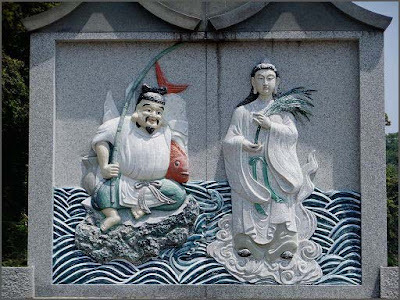 The steersman stands at the prow and performs a call-and-response prayer with gūji standing on the seawall. When this is done they cross the harbor and then there are three boat races. Kuniyuzuri The "transfer of the land." The term indicates a series of episodes in Kojiki and Nihongi related to the transfer of the land of Japan to the descendants of the heavenly kami (amatsukami) by Ōkuninushi, a terrestial kami (kunitsukami). After Susanoo, the brother of Amaterasu, descended from the heavenly realm to Izumo and slew the great serpent, he married Kushinadahime. Their child (according to the main text of the Nihongi) or grandchild (according to one alternative passage of Nihongi) was Ōkuninushi. 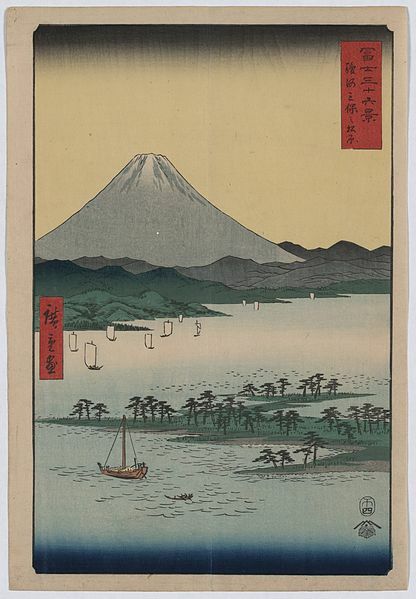 Ultimately Ōkuninushi and Sukunahikona worked together to solidify the Central Land of the Reed Plains (Toyoashihara no mizuho no kuni). However, Amaterasu and Takamimusuhi, wanting the land for their descendants to rule, sent a messenger to Ōkuninushi asking him to transfer the land. Both Amenohohi, the first messenger sent, and Amewakahiko, the second, took sides with Ōkuninushi and did not report back. Not only did the latter marry a daughter of Ōkuninushi and fail to report back to the High Plain of Heaven (Takamanohara), but he also became the practical ruler of the Central Land of the Reed Plains. Amaterasu then conferred with the deities of the High Plain of Heaven and sent Takemikazuchi accompanied by Amenotorifune (Torinoiwakusufune). 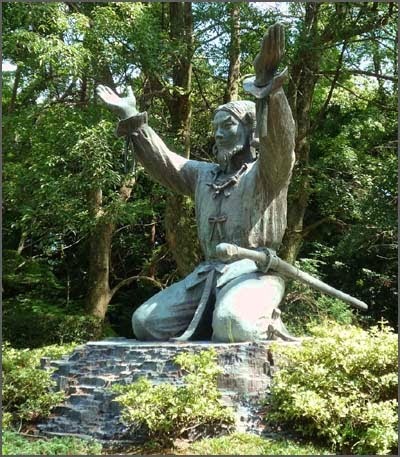 Takemikazuchi strongly urged Ōkuninushi to transfer the land, and received the allegiance of Ōkuninushi's son Kotoshironushi , and defeated another of his sons, Takeminakata, who opposed the plan, in a trial of strength. Then Ōkuninushi agreed to transfer the land, giving the unconcealed realm of the Central Land of the Reed Plains to the Heavenly Grandchild. Ōkuninushi retreated to govern the unseen world (yūkai, see kakuriyo) while being eternally enshrined in the Great Shrine (Izumo Taisha). With this preparations were complete for the descent of the Heavenly Grandchild (tenson kōrin). There also exist different traditions relating to the above events. For example, Izumo no kuni no miyatsuko kamu yogoto says that the true messenger sent down from the High Plain of Heaven was Amenohinatori, the ancestor of Izumo kokusō. It is now thought that the episode of the "transfer of the land" as described in Kojki and Nihongi represents a mythical version of the process of state unification under the Yamato court. This unification was achieved over a long period of time both through negotiation with powerful local families and through military conquest. Izumo seems to have retained its ancient political and religious authority until the very end, and it was only with its fall that final unification was achieved. This appears to have happened in the time of the emperors Sujin and Suinin. 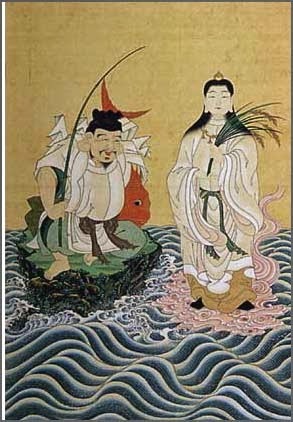 According to an "alternative writing" transmitted by Nihongi, Mihotsuhime was the daughter of Takamimusuhi no mikoto, given in marriage to Ōmononushi (see Ōkuninushi no kami). In the episode known as the "transfer of the land" (kuniyuzuri), Takamimusuhi warned Ōmononushi that if the latter took a wife from among the earthly kami (kunitsukami), Takamimusuhi would consider him to be disaffected. As a result, Takamimusuhi gave his own daughter Mihotsuhime in marriage to Ōkuninushi, charging him to lead the "80 myriad hosts of kami" and forever protect the imperial line. 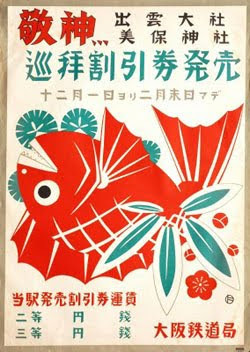 The region is closely related to wakame kelp and nori seaweed. The most famous are from the island Uppurui 十六島（うっぷるい）. Dating back to the time of Jingu Kogo on her war tour to Korea, and later Hideyoshi on the same war path. mekari no shinji 和布刈（り）の神事 is also practised at other shrines in Japan, for example at the Sumiyoshi Shrine in Shimonoseki, Yamaguchi 山口県下関市の住吉神社 on the first of January, in the first high tide of the night. The kelp is then offered to the deities. After this, in the naorai 直会 ceremony, it is eaten by the attendants. There is a shrine called Mekari Jinja 和布刈神社 at Moji, Kitakyushu, where seaweed is cut in the night from December 31 to January 1. This is a ceremony on the fifth day of the fifth lunar month, when wakame is eaten. The fire for preparing the meal for the vegetarian offering (潔斎食 kessai shoku) is made from special flintstone. The official food offering consists of cooked rice and salt, sesame seeds, vegetables, seaweed (wakame, nori, konbu etc.) and others. Miso and soy sauce are not used for this meal, since they are prepared using fire. This day is the Boy's Festival Day. This is a ceremony on the third day of the third lunar month. Nowadays it is held around the 7th of April. At the end of the rituals, wakame is eaten. The festival is in memory of a legend, when boats decorated with green brushes wrought into fences (ao fushi) came cruising into Miho Bay. 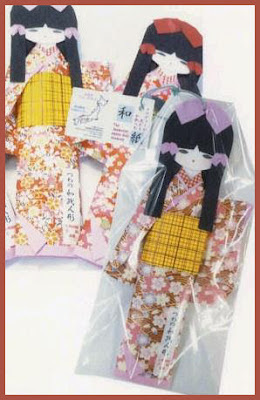 This day is the Doll's Festival Day. The morotabune boats look a bit similar to the peron dragon boats. There is another famous shrine of this name in Japan. at the famous pine forest in Shizuoka. a scenic area located on the Miho Peninsula in the Shimizu-ku area of Shizuoka, Japan. 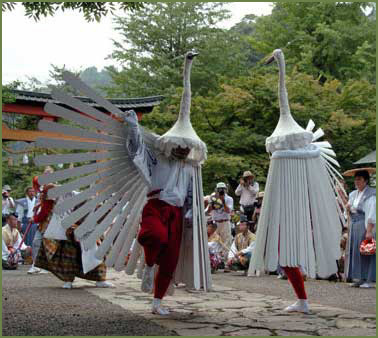 Miho no Matsubara is known as the site of the legend of Hagoromo(the Feathered Robe), which is based on the traditional swan maiden motif. The story of Hagoromo concerns a celestial being flying over Miho no Matsubara who was overcome by the beauty of the white sands, green pines, and sparkling water. She removed her feathered robe and hung it over a pine tree before bathing in the beautiful waters. A fisherman named Hakuryo was walking along the beach and saw the angel. He took her robe and refused to return it until she performed a heavenly dance for him. As the angel could not return to heaven without her robe, she complied with Hakuryo's request. She danced in the spring twilight and returned to heaven in the light of the full moon leaving Hakuryo looking longingly after her. On the second Saturday and Sunday of October, the city of Shizuoka holds a Hagoromo Festival near the site of the old pine tree. On the 14th day of the first lunar month. A divination of the coming harvest and good business made with rice gruel.
. tsutsugayu matsuri 筒粥祭 divination with rice gruel. If the reading is 8, it is better than a full 10. This festival was started by first generation feudal lord Matsudaira Naomasa in hopes for a good harvest and has been held every 12 years. The object of worship is carried on a boat from Inari Jinja Shrine 大浜住吉神社 to Adakaya Jinja Shrine. At the call of "Horan-enya" the procession, consisting of a line that is 10 kilometers long, carries a fleet of 100 decorated boats from one shrine to the other. The festival in 1997 was the Horan-enya's last event of this century. The last festival was held in 2009. At the front of some ships, a kabuki-like dancer performs his art. At the back of the ships, young drummers acompany a dancer, a young boy dressed like a girl, swinging his sticks. The festival starts early in the morning, bringing the mikoshi on a boat to the shrine Adakaya 阿太加夜（あだかや). 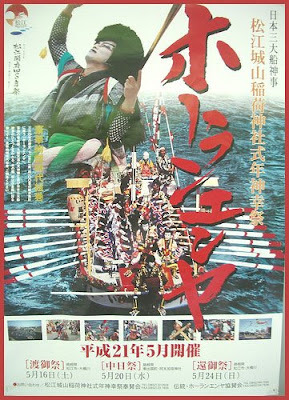 It is one of the three great festivals with ship processions in Japan. A major summer event emphasizing "the city of water". A magnificent display of fireworks over Lake Shinji-ko, and surprise events are held each year. 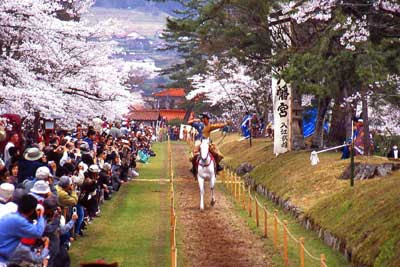 This festival began when the 5th generation feudal lord Matsudaira Nobuzumi greeted his wife in 1734. The people in the area made a drum to beat for the celebration. A float with two large drums, each measuring 2 meters in diameter, proceed through town as the sounds of the beats echo throughout the area. Held in Tamatsukuri Onsen, this annual summer festival consists of daily stage events and food stands. The stages are outside surrounding the Tamayu River, and performances range from music concerts to traditional dances, like Yasugibushi. At night, the area around the river is illuminated with decorative lanterns. One of the biggest events in the City of Water, Matsue Suigosai is held over two days in the city centre by Lake Shinji‘s shore. Many people wearing yukata and jinbei will enjoy the surface of the lake lit up by thousands of fireworks, while dance events and other performances are held on stage by Matsue City Hall. There are also many food stalls. Fireworks are usually from 20:00 to 20:30 on Saturday, and from 20:00 until 21:00 on Sunday, with a total of around 90,000 fireworks. This festival, dedicated to the local hot spring deity named Oyukake Jizo, takes place in the hot springs area of Matsue Shinjiko Onsen. Come by and pour hot water over the Jizo statue before watching the fireworks over Lake Shinji. Fireworks are usually between 20:00 and 20:30. 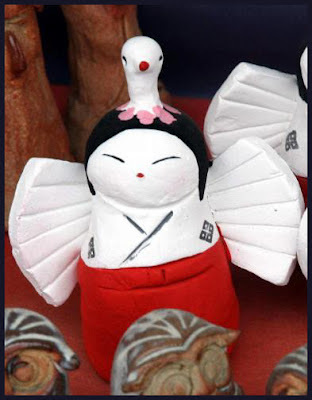 URL : Oyukake Jizo Festival (jp). This ritual is undertaken to purify the new rush mats upon which the tutelary deities of Sada Shrine are to sit. 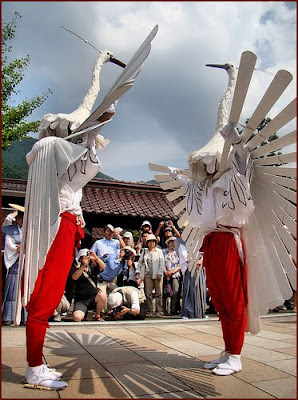 Another round of dances follows on the second day, including Sada Shin Noh, which was added to the UNESCO Representative List of the Intangible Cultural Heritage of Humanity in 2011. Created in the early 15th century, these dances have been handed down from generation to generation and are thought to have given its contemporary structure and content to the Kagura dances that today thrive in Shimane culture.